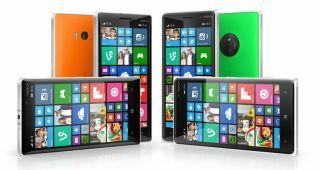 IFA 2014: Microsoft unveils new Lumia smartphones, wireless charger and software updates | What Hi-Fi? The first smartphones released since Microsoft officially bought Nokia have been unveiled at IFA 2014 in Berlin. The new Nokia Lumia 830; 735 and 730 dual-sim represent a refreshed series of mid-range handsets. Nokia had previously focused its attention on the high- and low-end markets, but these latest models fill the gap in the middle. With particular attention paid to the cameras, Microsoft has introduced the PureView camera technology - usually used in premium handsets - to more phones in the Lumia range. The Lumia 830 is billed as "the affordable flagship" and offers a similar experience to the Lumia 930 into a slimmer package. It features a 10-megapixel PureView camera with Zeiss optics and Optical Image Stabilisation (OIS). Other specs include a 5-inch full HD display, 1.2GHz Qualcomm Snapdragon 400 processor with 1GB of RAM and 16GB of onboard storage with a microSD expandable to 128GB - 15GB of free OneDrive cloud storage is also provided. The 830 will be available for €330 from October in black, white, orange and green finishes and comes running Windows Phone 8.1. This gives users access to the full Office suite of applications, OneDrive and Cortana. The Nokia Lumia 830 is also compatible with a new Smart wireless charger that alerts you when your phone is low on battery or has incoming notifications with a flashing, customisable light. The Nokia Lumia 735 and 730 dual-sim smartphones are, what Microsoft say, perfect for taking selfies and making Skype video calls. Both have a 5-megapixel 24mm wide-angle front-facing camera meaning users can get more into their photos. Both devices have the same spec sheet elsewhere too: 4.7-inch 1280 x 720 OLED display, 1.2GHz Qualcomm Snapdragon 400 processor with 1GB of RAM. 8GB of internal memory and a microSD card slot for up to 128GB cards, 15GB of OneDrive storage is also present. A rear-facing 6.7-megapixel camera with f/1.9 aperture and a removable 2220mAh battery round things off. The 735 is 4G compatible while the 730 dual-sim is just a 3G device. To make full use of the front-facing camera, Microsoft has created the Lumia Selfie App. With this, users are able to make adjustments to photos using a range of filters. The rear camera can also be used to take an even higher quality selfie, when using the Selfie App, the phone will beep when the user's face is centre. The Lumia Selfie app will be available from the Windows Phone Store now and can be used on any Lumia device with a front-facing camera. Microsoft also unveiled the new Lumia Denim software update. This will bring Cortana to UK users as a Beta. In the US, where it's already available, users will benefit from improved natural language, car kit integration via Bluetooth for contacts, reminders and calendar improvements. Users will also be able to say "Hey Cortana" to wake up the software, much like "Hey Google" for Android smartphones. The home screen of a Lumia device will also now benefit from Live folders. Working in a similar fashion to Live Tiles, folders can bring together all social media apps for example, and still show live notification information. Individual text messages can now be selected to be deleted from a thread or to be copied and pasted to forward on to another contact. Lumia Denim features the new Lumia Camera app - which replaces Nokia Camera - and works much faster. Microsoft claims it takes just 42 milliseconds to take a photo from standby by holding the camera button. When in the camera, a long press of the button will start 4K video recording at 24fps and 8.3-megapixels per frame. Users will be able save individual frames as images if they so wish. Rich Capture allows users to adjust light settings of photos after they've been taken. New Auto HDR and Dynamic Flash features can vastly improve photos to brighten them up and make them look more natural. The Lumia Denim update will come loaded on Lumia 830, Lumia 730 dual sim and Lumia 735 devices and will be available for all other Lumia Windows Phone 8 smartphones from the beginning of Q4 2014.